It does seem from comments left on this site, and elsewhere on 'the net', that First are indeed planning to run bendy buses in Plymouth on the Park & Ride services. There will be 9 coming down from Scotland to replace the current double decker's. It is not known where the Enviros will be going but it has been suggested they are heading out of the area, possibly to Weston-Super-Mare but none of this has been confirmed. 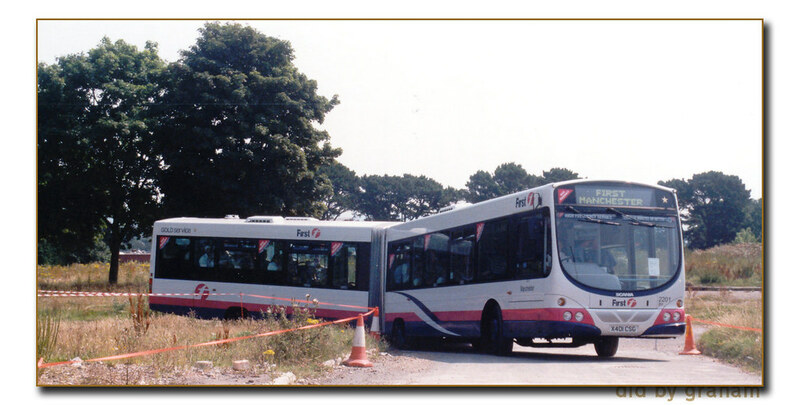 This is not the first time that bendy buses have hit the streets of Plymouth. In fact there have been quite a few over the years but up until now none of them have stayed. In 2001 First Manchester 2201 (10071 in new money) visited Plymouth and was used for free rides at the Western National Rally, which was held at Seaton Barracks. I don't think it was used in service at anytime. This bus was brand new at the time. Ironically it looks like it is still newer than the examples which are rumoured to be heading towards Plymouth as we are getting W reg buses. Having said that, if they are refurbished properly and given non dating registrations most passengers wouldn't know quite how old they are as the Wright body design has aged really well and still looks more modern that most buses we have in Plymouth, although Citybus hope to get their new Volvo Wright buses on the road in April which might just highlight the contrast of Citybus giving us new and First replacing their newest buses with much older second-hand ones. So we're losing some of the very newest and highest spec buses in the fleet, which also operate the most highest profile routes in Plymouth. In replacement we're getting twelve year old clapped out Glasgow cast-offs that have spent as much time broken then out on service, and which also have an extreme propensity of burning themselves out when they do actually get out onto the road. Blogger doesn't seem to be allowing web links of any length. I've had to break it into two. Delete the space after 'sets' when copying and pasting into your browser. The face of First in Plymouth will totally change this year, mark my words. I reckon the new face will be a handful of buses in the new damp squib livery and an even older fleet profile. I thought the new livery was only for new and refurbished buses so unless we get anymore Tridents from London then it may be a while to wait?